only interested in raising a few fish to eat and fertilize our grow beds. I have never had fish in my life so I am surprised at how interesting fish are. When we decided to build the greenhouse to start aquaponics gardening, we knew we would have to buy a few fish from a breeder and then breed them as our systems got larger and as we harvested stock for dinner. 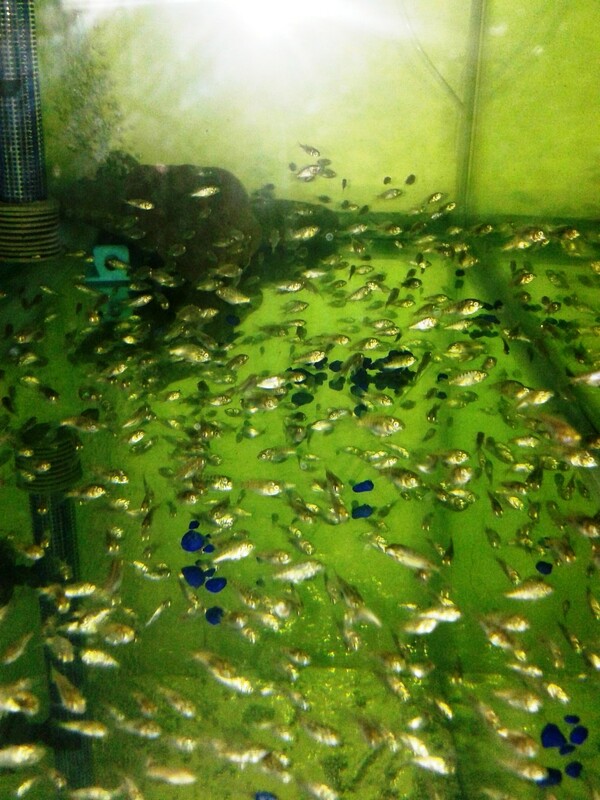 So I studied to learn more about tilapia breeding. Our first breeding was by accident, as told in a previous post: Best Laid Plans: Our venture into aquaponics. Then we began purposely trying to breed, which yielded 300-400 offspring with each pairing. Thank God there is a market for tilapia. Anyway we made a lot of mistakes, but I think we have now learned how to best breed when we need. Although accidents still happen in the big tanks-think hormonal 18 year old! Unfortunately most of the accidents end up getting eaten by the adult fish in the tank before we can extract them. Here is a digest of what we have learned if one is thinking about breeding tilapia. 1) Have a separate breeding tank away from the aquaponics system so that the breeding can be better managed. 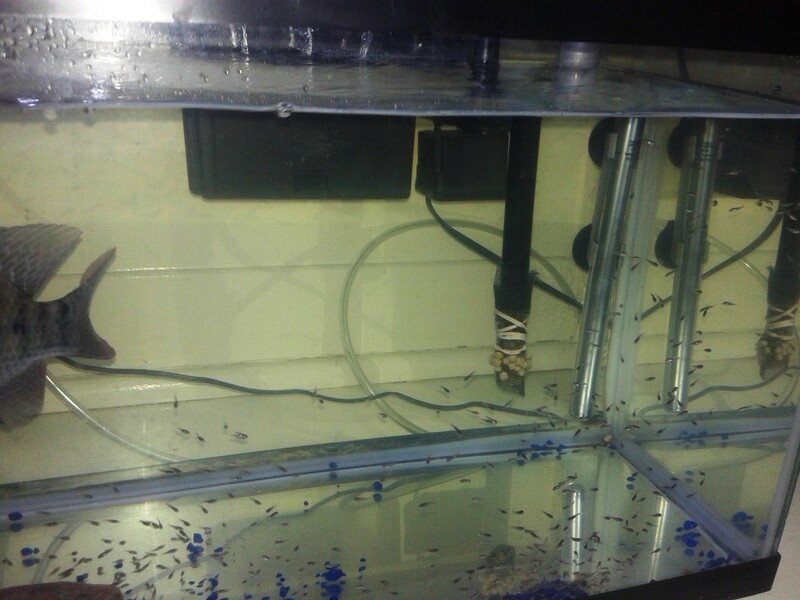 2) Start with about 5 fish around 5-6 months of age-say 2 males and 3 females. Be sure that the females are a little larger than their potential male mates. 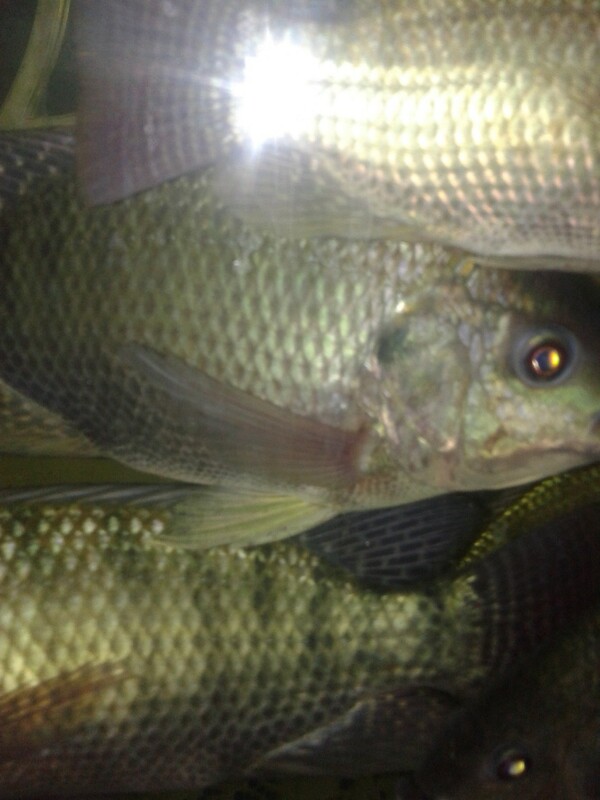 Male tilapia are very aggressive and will kill the females if they are not producing when the male is ready. Larger females can better defend themselves. 3) When the timing is right, a male and female will begin to pair. The male will be aggressive toward all other fish to keep them away from their fertile female. When this occurs, it is best to remove the other fish. 4) The female will then lay the eggs on the tank bottom in small piles. 5) The male will begin to hover over the eggs and fertilize each pile. This may occur 2-3 times until the female is satisfied that the eggs are fertilized. Once complete the male needs to be removed as he will be aggressive toward the babies and eat them. 6) Once fertilized, the female will scoop all the eggs into her mouth, keeping them warm and safe for around 7 days. Between day 7 and day 9, the female will release the new born fish into the tank. at release they are less than 1/16″ long. 7) When the female feels safe enough to release the babies, now called fry, she can now be removed from the tank. We have had mothers eat their fry in the first few days. 8) Mother removed, the tank is now completely siblings-usually between 300 & 400. They are fed fry powder the first few weeks before moving into larger food or duckweed. Process complete until we decide to mate again. I can’t wait to try this out. I’ve always wanted to do Aquaponics. Pingback: Aquaponics for Organics: Breeding Tilapia | Eat Organic. Live Organic. Be Well. Do you sell live Tilapia for home aquaponics? I got the system from a guy who had Aquaponics for a year, now that I my license to grow Tilapia looking to buy fingerlings. Breeding and selling are not my goal. I did breed for my own use and ended up having to sell some simply because of the amount produced. When I accidentally have an over abundance I will sell, but that is not currently the state. Glad to hear you are getting into aquaponics though. I think its fascinating. Good luck.